On the surface, this custom diamond ring is certainly stunning. A crisscross of diamond bands. A yellow princess cut diamond, accented with a custom diamond halo. Beautiful. But the story goes deeper than just a ring. The intense yellow diamond started out as a beloved pet dog. After he passed, the couple send the dog’s cremated remains to a company that specialized in manufacturing ashes into diamonds. No kidding – the company is legit. It took almost a year, but then one day, this gorgeous yellow diamond arrived in the mail, complete with authenticity papers. The couple knew they wanted a diamond ring, but the design had to be perfect. So they made an appointment at Scott’s Custom Jewelers and the fun began! Scott listened to the story, and with the use of CAD (computer aided design) technology, he worked directly with them to come up with this style. The band, when it is on her finger, looks like legs and the body is the yellow diamond center. This actually happened by accident, but ended up being a terrific part of the overall design. Scott has been using CAD to custom design rings, pendants, earrings and bracelets for over 10 years now. He, along with his staff, have become quite good at guiding customers through the jewelry design process. It’s not a “plug and chug” process where there is a catalog of styles to “customize” with center stones. Scott has perfected the custom jewelry design process so that our customer’s not only end up with amazing custom jewelry, but also have a great, stress-free time doing so. During the jewelry design process, Scott made pictures of the ring, and sent them via email to the customers. Then, after some tweaking (not twerking – way, way different! ), Scott used our 3D printer to make a polymer model of the jewelry. He painted the model silver, and placed the diamonds in it so that she was able to see the jewelry on her hand before it was even casted into gold. This important step really helps the customer visualize the custom jewelry. After the model was approved, Scott made another polymer model and casted the piece into white gold. 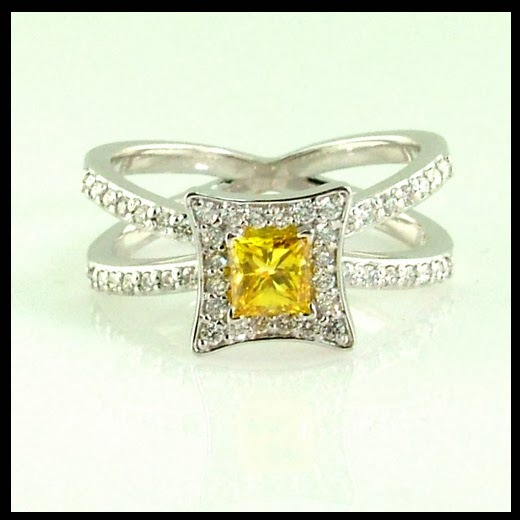 Jon, our awesome bench jeweler, set all of the diamonds, including the special yellow diamond. The finished piece looked fabulous. When the couple came to pick it up, it was hard not to shed a few tears (OK, some were shed – we’re animal lovers here). But happy tears are fine. And being able to make this jewelry dream come true was wonderful.